Team Penske played with threes at the track that happens to have three corners. 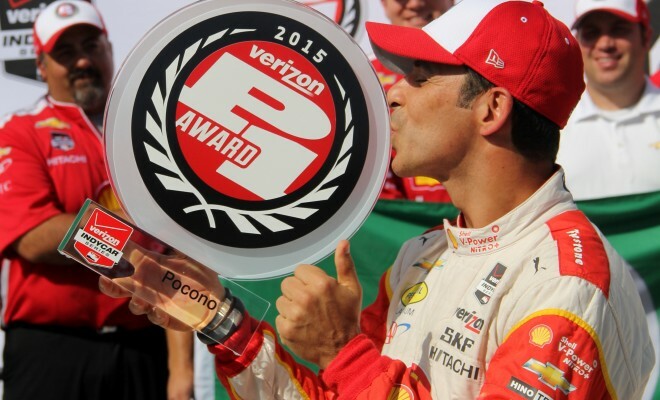 Helio Castroneves led a 1-2-3 sweep for Team Penske at Pocono Raceway in the No. 3 Chevrolet for Sunday’s ABC Supply 500 – the penultimate race in the series’ 2015 campaign. With a average two-lap speed of 220.530 mph, Castroneves edged Simon Pagenuad to win his 45th career Verizon IndyCar Series pole. The eyes were in the sky on pit road as cloud cover was hit and miss. Traveling at speeds more than 220 mph, even cloud cover can make the drivers nervous. “When you start building anxiety and you don’t know what’s going to happen, You’re like, ‘Oh boy, let’s just get going.’” Castroneves said. First-year Penske driver, Pagenuad, scores his fifth front-row start of 2015 but was understandably left disappointed after sitting in P1 for a majority of the extended session. 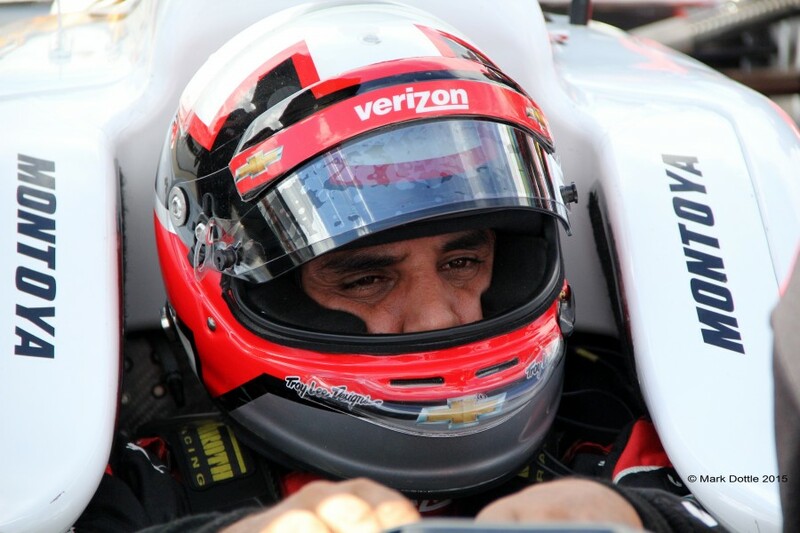 With Will Power starting third, where is Juan Pablo Montoya? A major lift in Turn 1 on his first of two timed laps was the culprit for a 19th-place starting spot for Sunday. “We’ll see what it brings,” Montoya simply stated. His closest championship rival, Graham Rahal, surprised even himself after qualifying fifth in his Rahal Letterman Lanigan Racing No. 15. 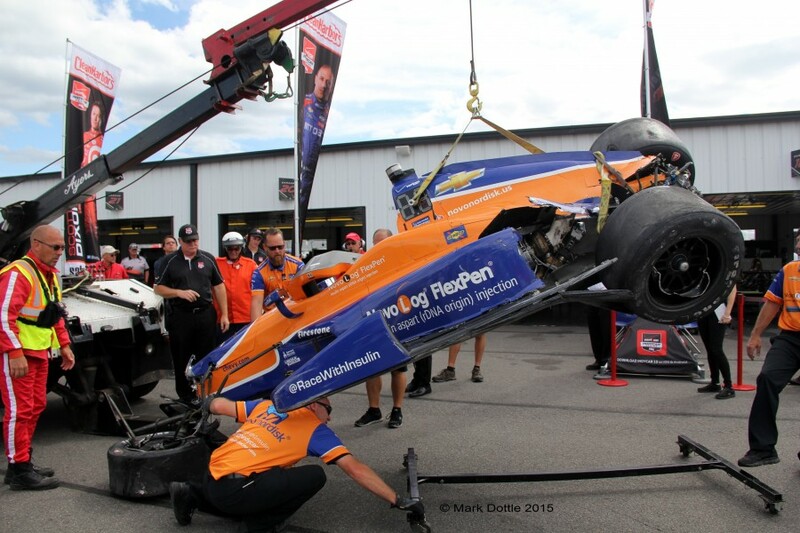 “Starting practice today we were so slow,” Rahal said. 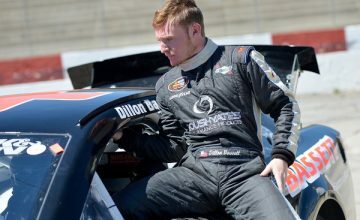 “I was really concerned and all of a sudden the car kind of came to life. The highlight of the session was, for lack of a better term, ‘high’ for Charlie Kimball who sailed into the Turn 3 wall, lifting and riding the catch fence. A 48-minute red flag followed before qualifying could resume. Rounding out the top 10 starters is Josef Newgarden in fourth – the highest American driver – with Carlos Munoz sixth, Justin Wilson seventh with Ryan Hunter-Reay, Takuma Sato and Sebastian Bourdais. 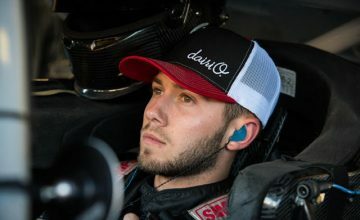 The two hometown favorites, Marco Andretti and Sage Karam, showed promise in practice but were far off the top times – ended the session 22nd and 20th, respectively. 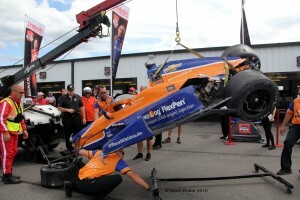 Andretti had a close call on the first lap, which he believes cost him a much better qualifying position. 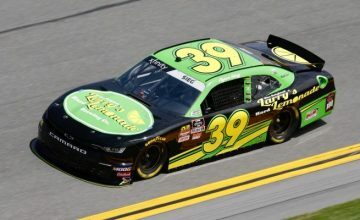 For the third time since the track’s return to the schedule, Pocono will have speed, strategy and maybe an adjustment of two that will decide who gets the checkered flag.